Olive Tree Genealogy Blog: Local Museums - an Overlooked Genealogy Treasure Trove! Local Museums - an Overlooked Genealogy Treasure Trove! Readers of Olive Tree Genealogy blog know that a few weeks ago I purchased an antique cook stove made in Guelph Ontario Canada. Both my parents were born in Guelph and my father's ancestry there goes back to the 1830s. Not finding much information online about the Guelph Stove Company, I wrote to the Guelph Civic Musuem. The Assistant Curator, Kathleen Wall, responded very quickly to my query and provided details on the history of the company. I'm always looking for information on places my ancestors worked, so I decided to ask Kathleen if the Museum had any information or photographs for a few of the places I knew family members worked. My great-grandfather Peer is listed in several Guelph City Directories pre 1900 as working at Robert Stewart which I was pretty sure became Stewart Planing Mills. My grandfather McGinnis worked at Page-Hersey in 1917 and perhaps other years. 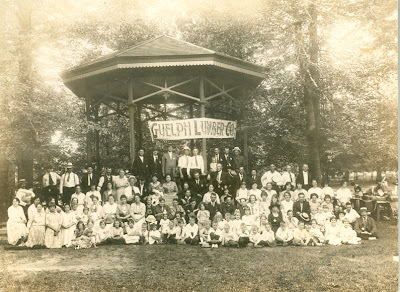 My maternal grandfather worked at the Guelph Lumber Co. before 1941. And my father worked at Biltmore Hats in Guelph before WW2. "The Guelph Lumber Company was established in 1913 on Duke Street, Guelph, near the Allan Bridge. The manager was Jason Harrison at that time. At the time of this photograph, the manager was Charles H. Fuller. The mill specialized in lumber and planing mill goods, doors, inside finish and hardwood flooring, as well as outside blinds and "Canada Ideal" cedar dye sticks." I almost fell off my computer chair! Charles Henry Fuller was my grandfather! I never expected to find his name mentioned. And my genealogist brain immediately saw those all-important words "...at the time of this photograph..." A photograph? Wow. I wrote to Kathleen asking if I dared hope there was a photograph in the possession of the Museum. Her response included a scan of a wonderful photograph of a summer picnic for the Guelph Lumber Co. It is obvious that employees and family members were invited as there are many women and children. The Museum had no knowledge of who any of the individuals were in the photo, nor of the exact year although they estimated it was circa 1930. Courtesy of Guelph Civic Museum. Saving the photo to my computer and enlarging it in Picasa allowed me to have a good look at the faces. And there they were - my grandfather Fuller, his wife my grandmother and their two eldest daughters - one being my mother. I could see that mother was about age 5 or 6 which would date the photo to circa 1921 or 1922. And since their youngest sister who was born in July 1923 was not in the photo that confirmed that the picture was taken before that year. As an aside, anyone wishing a copy of this specific photograph can write to the Museum and request it by using the Museum ID# I have included in the caption. "Edith Fuller – listed on a 1916 Roll of draft for the 11th Brigade and 29 and 36 Batteries"
But that wasn't all. Kathleen informed me that the Museum has two High School yearbooks, for 1932 and 1933 and my mother is in them. I happen to own the 1931 and 1932 yearbooks for Guelph Collegiate Vocational Institute (GCVI) and my mom' s class photo is in one. So the 1933 Museum copy is of great interest to me! I'm meeting Kathleen in June at the Museum at which time she is going to show me the yearbook and other items. The Museum charges a small fee for research but I didn't think it was enough for all the work Kathleen did so I wrote a cheque for a more substantial donation. Supporting local museums is a good cause and I took up a lot of the Assistant Curator's time. My advice to genealogists is to contact the local museum where your ancestors lived. Write a friendly short note and ask if they have specific information on one or two of your ancestors or on a local company where your ancestor worked. Don't overwhelm them with a long list of questions! Keep it brief, keep it simple and be polite and friendly. Ask what their research fees are and offer a donation to the Museum. When your first request is met, that is the time to ask for more help if you require it. But remember you are taking up their time and asking for their help so don't expect it to be free. Even if they don't charge for research services you should make a donation. That's only fair. If the Museum sends you photographs or information that you want to use on your blog or distribute to other family members, please do ask their permission. There may be copyright issues that you aren't aware of, and besides it's just common courtesy to ask. Oh, and remember to thank the staff member at the Museum who assisted you. And be patient. The Museum may or may not have staff that are available to give you the kind of help I got from Guelph Civic Museum. You are an inspiration to me! No wonder your blog wins awards. BLUSH! You are so kind! Thank you but honestly I think Kathleen is the wonder worker. She went above and beyond in finding so many records of my family. What a great find! One never knows until one asks! The staff and volunteers at museums are true gems. Have you tried the Photo Database at the Guelph Public Library? Oh Where oh Where Have my Digital Files Gone? Civil War Era Photo Album Arrives! Lesson Learned: Back up Your Blogs! Dropbox Just Keeps Getting Better!